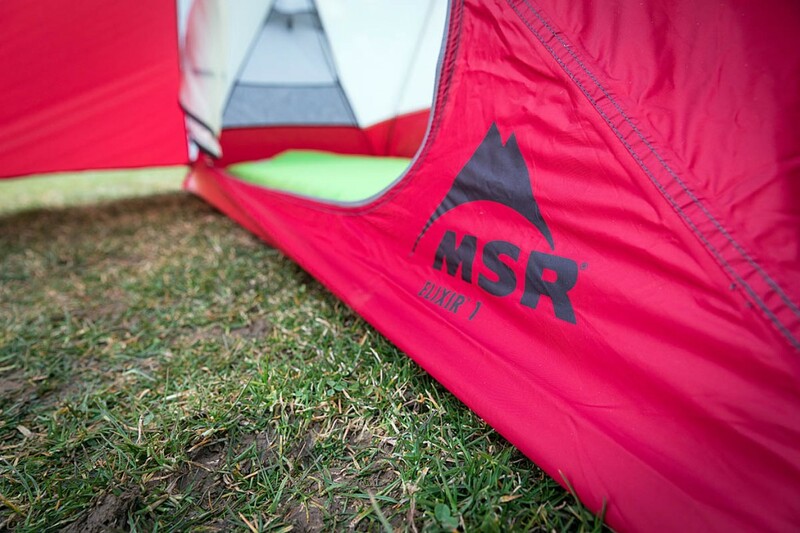 The Elixir 1 is a new addition to MSR’s range of backpacking tents. 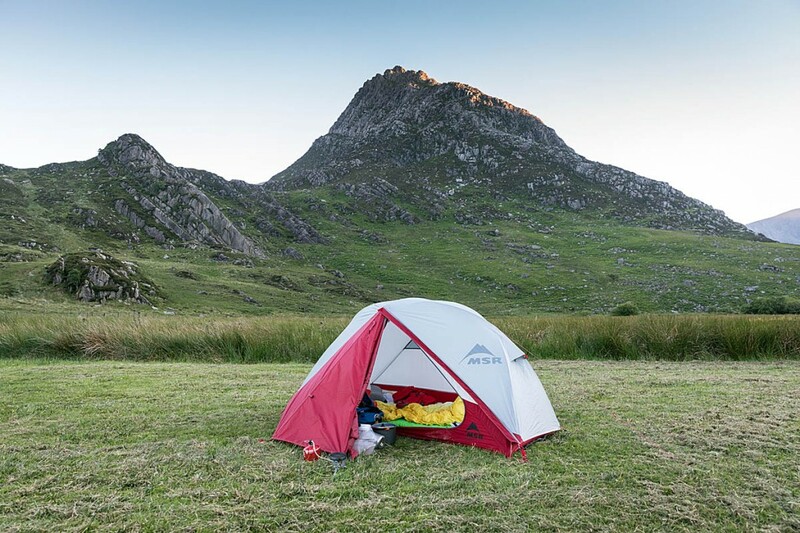 The tent is supplied with a footprint, which you can either use to provide extra protection under the groundsheet or, in warm conditions, use as the tent floor with just the flysheet for shelter. The beauty of the Elixir 1 is its ease of use. It also provides a good amount of space for both the solo backpacker and his or her gear. Putting up the tent is pretty simple: peg down the footprint if you want to use it. The shockcorded aluminium poles come as one unit, connected and colour coded. There is also a separate small ‘floating’ pole that goes across the apex of the tent. The inner tent is laid out on top of the footprint and the colour-coded poles are inserted into the red and grey metal grommets at each corner of the tent. The inner tent is then clipped on to the two crossed over main poles. These are again colour coded. The short pole goes across the main poles and is inserted into two metal grommets in the roof of the inner. The fly can then be placed over the poles, again with the short, floating pole fitting into grommets in the fly. The fly’s metal main grommets are then attached to the pole ends at each corner and the porch can be pegged out. Adjustment straps and buckles at each corner of the outer tent allow good tension to be applied to the fly and there are guys at each end plus the side and porch of the tent, though our Elixir 1 only had enough pegs to guy-out all the lines bar one. It’s important to remember to seat the cross pole in its grommets both on the inner and the fly before tensioning the tent, as you’ll find it difficult to reach and place them otherwise. 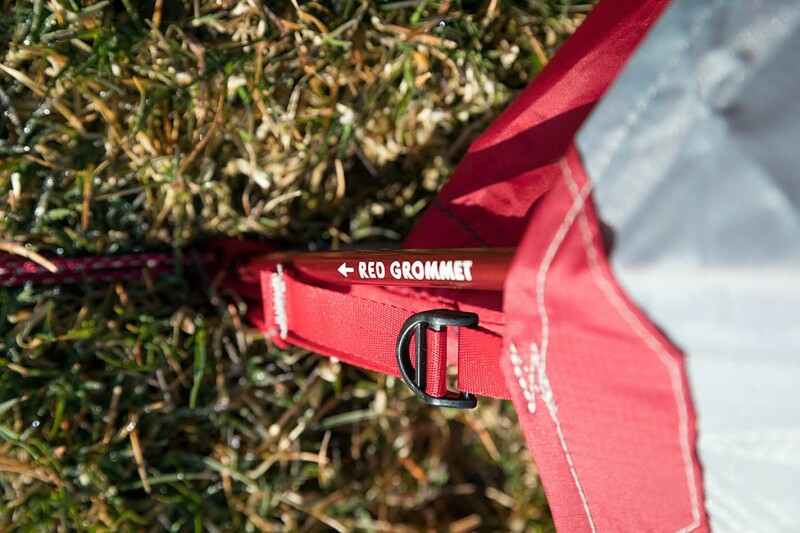 The porch section of the flysheet is coloured red to make it easier to figure out which way to place it over the inner when erecting the tent. The inner tent is mainly ripstop fabric with mesh panels in the ends and roof to help ventilation. We didn’t encounter any great build-up of condensation during use. The ends of the flysheet also have a vent flap with a rigid stay to keep them open. The tent has one door on its side with a good free-running zip with glow-in-the-dark puller. The porch can be opened either one-third or two-thirds, depending on the weather. The vestibule is a good size, and easily accommodated both a day sack and a kit bag. The inner tent has good headroom with room to spare when sitting up; it was even possible to kneel in the tent without touching the roof. There are mesh stash pockets in each end of the tent, plus two in the roof. The roof also has four small hanging loops. Quality of the material, fittings and manufacture was good. 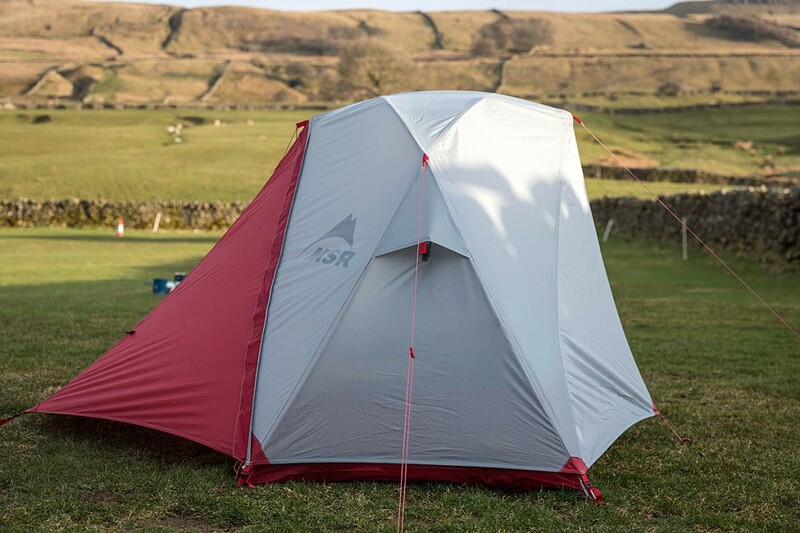 The pegs are round-section alloy rather than the tri-section ones found on some MSR tents, but overall the Elixir 1 felt well made and well designed. The all-in-one pole grouping and colour coding made it very easy to erect and the tent was quite roomy for a one-person model. It’s not the lightest of one-person tents, however, tipping the scales at just over 2kg. Leaving the 128g footprint out of your pack will take it back below the 2,000g mark, but the pack is still relatively large compared to, say, MSR’s Freelite 1. The Elixir 1’s groundsheet has waterproofing to 3,000mm hydrostatic head. But the extra weight and size is the price you pay for a tent that offers the solo traveller a modicum of space, both in headroom and storage. We found the Elixir 1 stable in winds and largely free from condensation problems thanks to the mesh panels on the inner. Often with one-person tents, there’s a sense of lack of space, even to sit up in, but the generous 1m headroom and good length internally made for a comfortable experience. We really liked the ease of putting the tent up, and the quality was up to the usual high MSR standard. Both in wild camping and basecamping, the tent performed well. 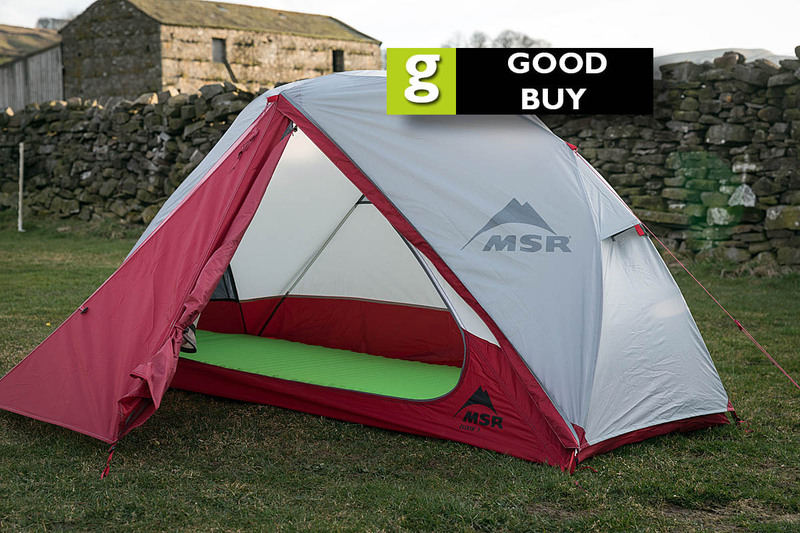 The Elixir 1 is also at the affordable end of MSR’s lightweight tent range. The Elixir 1 was supplied to grough by MSR. More details are on the MSR website. 8 out of 10 when the first thing you have to do when you have just spent £200 is to go out and buy some decent pegs!!!! !